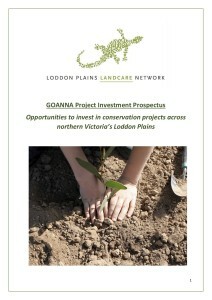 This prospectus provides options for conservation-minded citizens or corporations to invest in the Loddon Plains Landcare Network’s landscape restoration project, the GOANNA Project. The GOANNA (Group Organised Action Nurturing Natural Assets) Project is the Network’s flagship partnership project with The Norman Wettenhall Foundation (NWF). It is a landscape-scale restoration project designed to protect and enhance biodiversity across the Loddon Plains. The Loddon Plains is rich in natural assets. It is home to a diverse range of flora and fauna, along with rivers, creeks and wetlands that have supported aboriginal communities for thousands of years and still today sustain important water-dependent ecosystems. It is also an area recognised for its high quality agricultural production based around grain and fodder crops, lamb and wool production, dairying and horticulture. The Loddon Plains Landcare Network recognises that a healthy environment is fundamental to a thriving agricultural sector and a sustainable community. With financial assistance from The Norman Wettenhall Foundation, the Network has produced a BLUEPRINT for the long-term conservation of biodiversity in the network area – to be achieved through coordinated, large-scale landscape restoration projects. A series of large-scale projects, developed in conjunction with member groups, are being scoped using a process called ‘INFFER’ (the Investment Framework for Environmental Resources). In addition to the proposed on-ground works, community education is a vital component of the GOANNA Project. Workshops and field days will be extended to the wider community wanting to learn more about the importance of biodiversity in sustainable farming systems.